Reverberations from the ongoing political and economic turmoil in far-off Venezuela reached Greece this week, after the former’s National Assembly President and self-declared interim president, Juan Guaidó, pointed to what he called the Tsipras government’s support of the “Maduro regime” in Caracas, saying this was “worrying”. 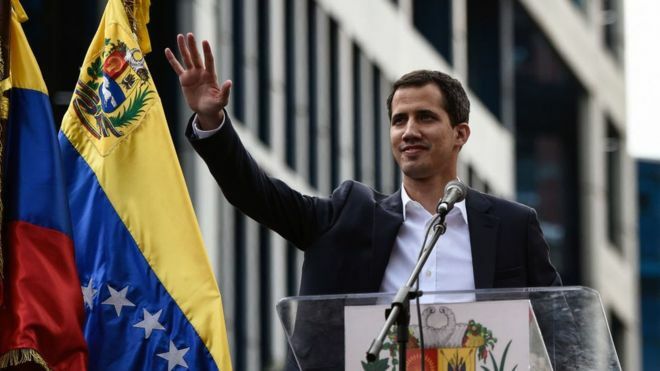 In an interview with Athens-based Skai-TV reporter Iasonas Pipinis, the 35-year-old Guaidó invited left-wing Greek Prime Minister Alexis Tsipras to visit his South America country as soon as possible in order to see, for himself, the situation there. Tsipras and his radical leftist SYRIZA party, which has governed thrice bailed-out Greece since 2015, have in the past spoken very favorably of the socialists governments of Nicolas Maduro, and his predecessor, Hugo Chavez. Although the current government has avoided clashing with the EU’s position regarding the current situation in Venezuela, ruling SYRIZA party has expressed continued support for Maduro and his beleaguered government. Guaidó also called on Athens to fall in line with the rest of the EU in order to “restore democracy (in Venezuela) and to end starvation (there), so that we can move ahead… I would not like to get involved in Greece’s internal politics or its national interests with more details, but I do call on the Greek prime minister or any other member of his party to come to Venezuela as soon as possible…”.